A few months ago I shared the wonderful tasting my husband and I experienced at Loring Wine Company in Buellton, Santa Barbara County. Because we were already fans of Loring we were not surprised by the exceptional quality of each of the wines we tasted. However, Loring shares their tasting room with a winery to which we were previously unfamiliar: Cargasacchi Wines. That wonderful winter day in January as we were wrapping up our wine tasting, our tasting hostess Brittany invited me to try a sip of Cargasacchi’s dessert wine. The beautiful orange-topaz color was so inviting I opted for a sip. It was delicious; however, at that point our tasting and purchases were complete so I thanked her for the taste and we went on our way. All night the taste of the dessert wine haunted me; taking me back to a fantastic wine dinner I experienced in Valpolicella hosted by Villabella Winery at their exquisite hotel on the wineries property: Villa Cordevigo. So many outstanding wines were poured that evening and I never knew what I was drinking. The last wine of the night was a beautiful topaz dessert wine paired with special cake the Executive Chef made for our table that his grandmother used to make for him growing up in Naples. The wine and the cake were outstanding and most memorable! Tasting the Cargasacchi dessert wine gave me a visceral response of that evening; I simply had to have some of that wine. 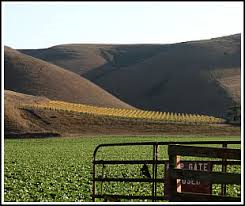 So as we were leaving the Santa Ynez Valley to head into Santa Barbara then on to Ventura County we stopped back by the Loring Wine Company tasting room and I bought a few bottles of the Cargasacchi 2010 Invincible Sun Late Harvest Pinot Grigio. 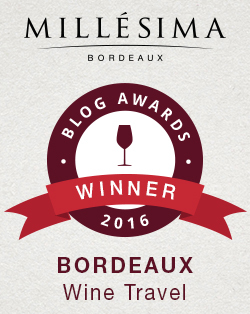 In my article “How About Napa’s Summer In Your Glass,” I shared with you the great night we enjoyed hosting a dinner party for some of our Dallas area wine friends that I met through social media. 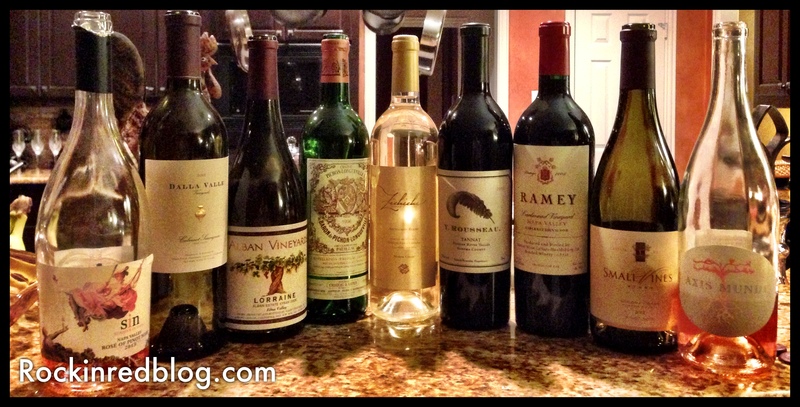 If you need a reminder below is a look at many of the wines we enjoyed that evening in late April. However, one wine not included in the picture of spectacular wines is the Cargasacchi dessert wine that I could not wait to serve to my special guests. 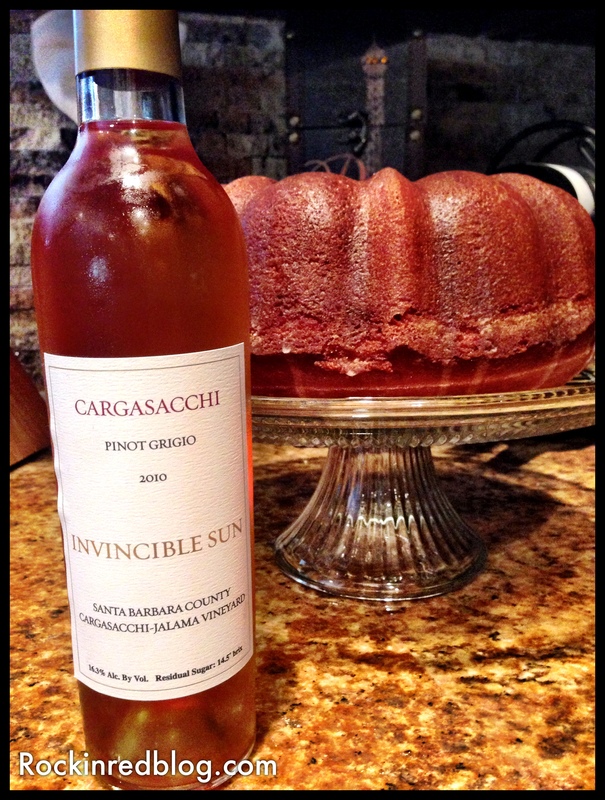 Cargassacchi 2010 Invincible Sun Santa Barbara County Late Harvest Pinot Grigio: This beautiful dessert wine met the eye with a dazzling orange/topaz color and opened with flavors of apricot, orange blossom and honey with a touch of nutmeg. Those delicious flavors followed through on the palate adding a touch of caramel in a sweet and creamy texture with round acidity and great balance. 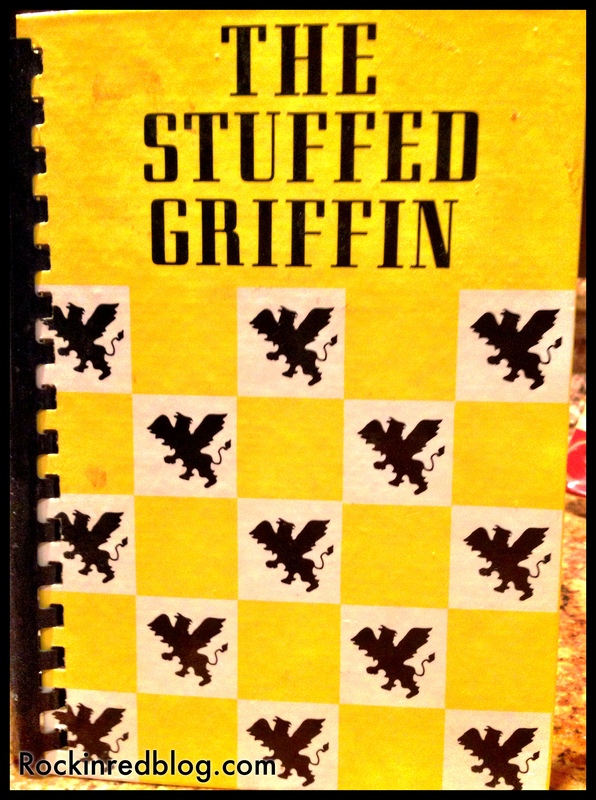 It was well-structured with a lingering finish on the palate. I absolutely loved this wine! It is the perfect dessert wine and would pair beautifully with cheese or crumb cake. 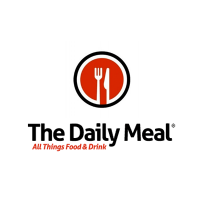 Click here to find this wine. Sometimes I chose wine to pair with food and sometimes I chose the food to pair with the wine; this case was the latter. I thought long and hard and did a bit of research as to what dessert would best accompany this lovely wine. Although the wine would pair great with cheeses I served cheese as part of our appetizers and did not want to serve it again. Therefore, it had to be a dessert and since the wine was sweet the dessert needed to be fairly sweet as well. 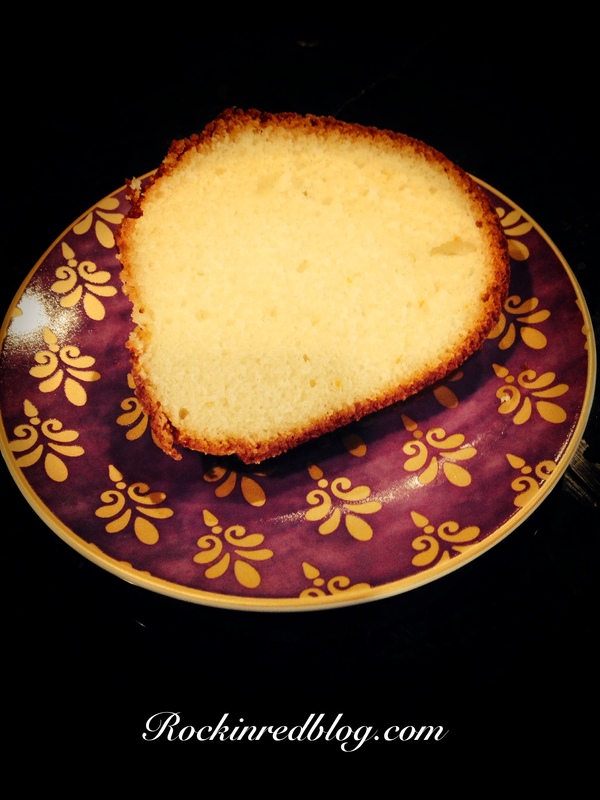 Since I had the wonderful dessert wine in Valpolicella with cake I had my heart set on cake. 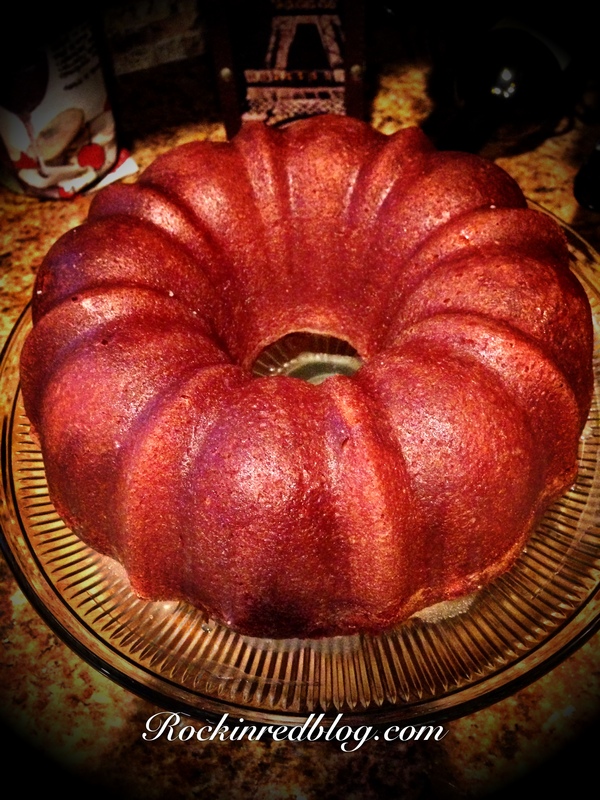 Though I considered making an Italian cake I decided to stick to my roots. My 94 year old grandma who lives in Georgia has been making me sour cream pound cakes my entire life and they are outstanding. 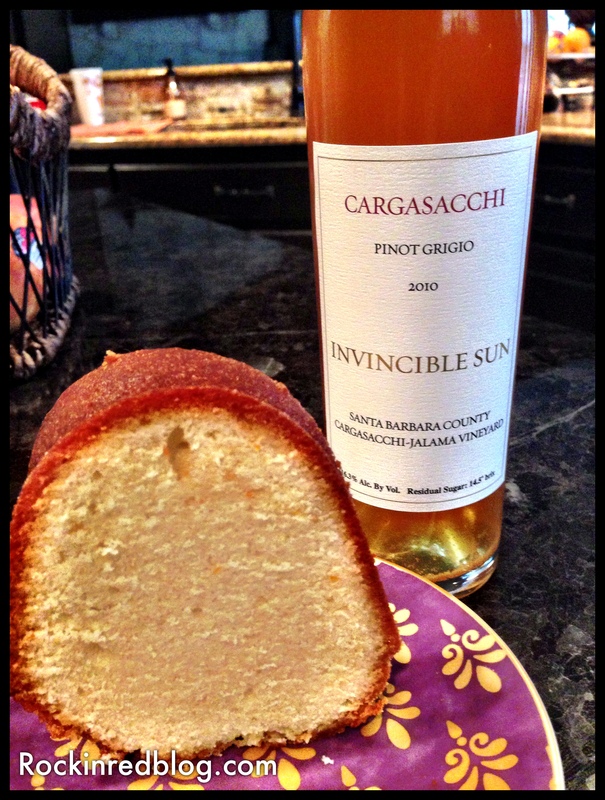 That was my dessert answer; I decided to use Mimi’s recipe but alter it slightly to add an orange zest to pair with the Cargasacchi Invincible Sun. 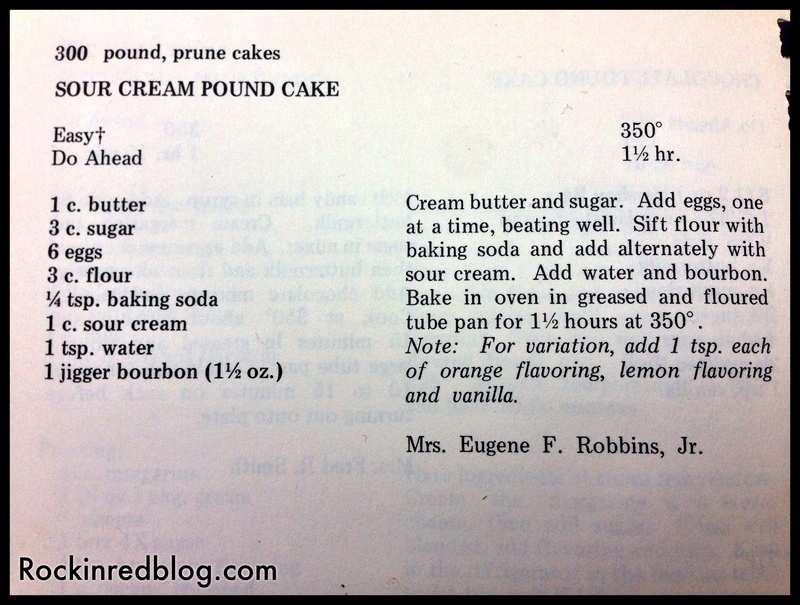 As you read this tried and true Sour Cream Pound Cake recipe note that I omitted the jigger of bourbon and added 2T of orange juice and 2T of orange zest, giving the cake an essence of orange that paired beautifully with the wine. I was so pleased with the results. I felt I may have over baked the cake by about 5 minutes but my guests loved the cake and the wine and best of all they totally understood the pairing and how it was a beautiful marriage of flavors, textures and weight! A true success to a wonderful evening! Cargasacchi describes how the Invincible Sun was made: The Pinot Grigio grapes for the Invincible Sun are allowed to ripen to the maximum physiological ripeness and concentration that the vine and given weather conditions are able to produce. At maximum natural ripeness, the arm, where the trunk emanates from the head of the vine, is cut. At that time all leaves in the fruiting zone surrounding the grape clusters are removed to expose the fruit to direct sunlight from early morning until sunset. After an additional 2-3 weeks of hang time, the dehydrating fruit is harvested at an extremely ripe state without botrytis and without any mold. This wine is not produced every year, with onshore weather occasionally causing wet rot and loss of crop. Only the perfect and unblemished fruit is picked. It is picked cold, and then pressed and fermented in neutral barrels. About Cargasacchi from their web site: Peter Angelo Cargasacchi is the fifth generation of his family in California, but the first born in California. Peter planted Cargasacchi vineyard in 1998 in the Santa Rita Hills AVA, and began planting the subsequent Jalama vineyard in 1999. The roots of the Cargasacchi winemaking philosophy are found in the Italian traditional pairing of food and wine at mealtime. Both Peter’s and [his wife] Julia’s families have been making wine for consumption with food for many generations. This tradition continues in California. Using estate fruit, Peter and Julia produce two Pinot Noirs under the Cargasacchi label and one late harvest Pinot Grigio. 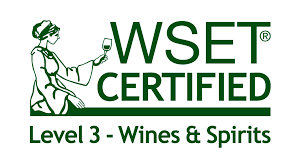 They also produce Pinot Noir, Chardonnay, Pinot Grigio and Syrah under the Point Concepción label from estate and purchased fruit. 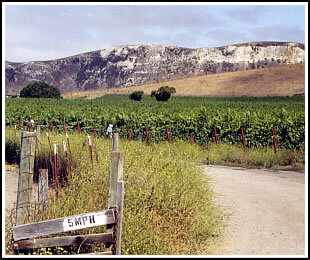 Because of his outstanding viticultural skills Peter Cargasacchi grapes are sought by many top Pinot Noir producers in California. 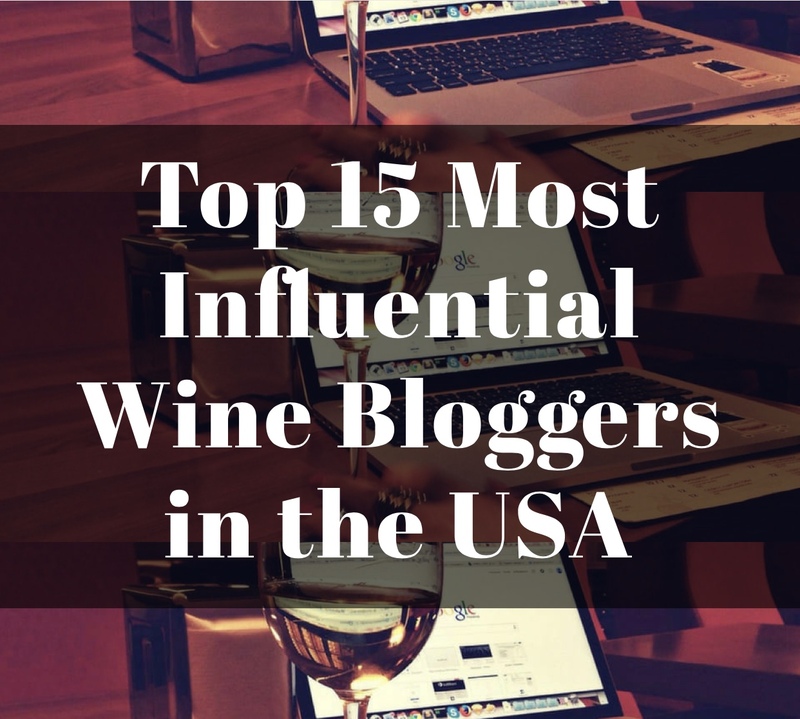 The list includes: Loring Wine Company, Babcock Winery, Ken Brown Winery, Siduri, Brewer-Clifton, Bonaccorsi, and Hartley Ostini Hitching Post Wines. I strongly encourage you to visit the Cargasacchi web site to learn more about the winery, view the entire portfolio of wines and order some wine for yourself. Additionally, I encourage you to seek out these listed Pinot Noirs from Cargasacchi vineyards. My Song Selection: The song I have chosen to pair with the delicious Cargasacchi 2010 Invincible Sun Late Harvest Pinot Grigio is The Sweetest Thing from U2. Both the wine and the song are smooth and effortlessly pleasing; light yet full of flavor with a long clean finish. 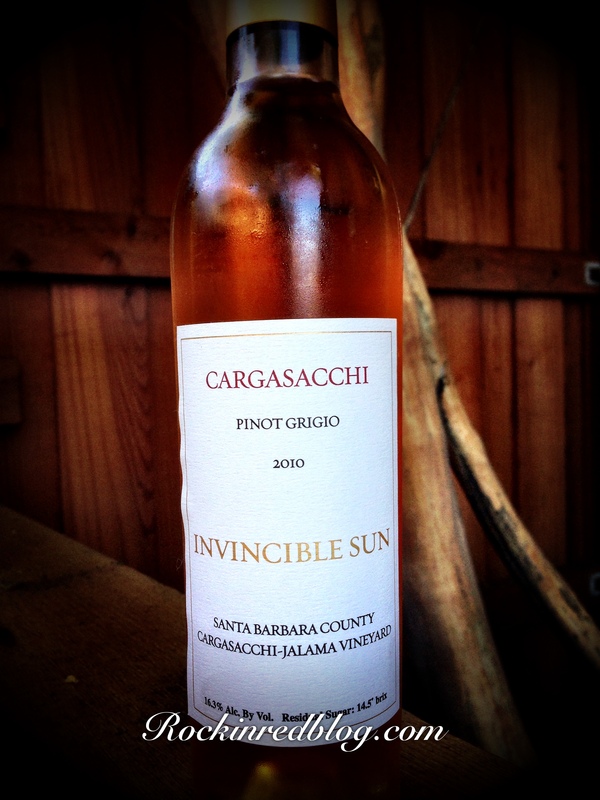 Get your own bottle of Cargasacchi 2010 Invincible Sun Late Harvest Pinot Grigio and let me know what song you pair with it. Cheers! I love Alsace late harvest (Vendanges Tardives) Pinot Gris, was this similar in style? Sounds delicious either way! Hi Frank. I have not had the pleasure to enjoy an Alsace late harvest PG. This wine was outstanding. What a great looking cake. YUM!